Cultivated and wild flowers of all kinds make appealing subjects, particularly for the watercolourist whose subtle and transparent medium is uniquely suited to capturing their beauty and their delicacy. Complexity of form and detail, however, sometimes conspire to produce over-working, and when this happens the principal delights of watercolour - its freshness and transparency - are lost, and accurate but dull and muddy images emerge. 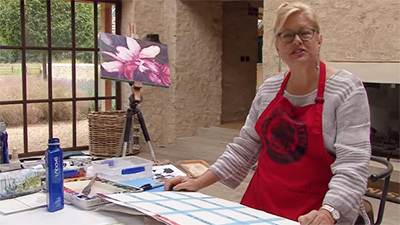 A video has recently appeared in which Karen Simmons tackles the difficult but fascinating task of painting flowers in watercolour and demonstrates how she goes about capturing both their form and their glowing colour. She begins by describing how she sets about drawing her subjects, and this she does in considerable detail. She uses charcoal in her demonstration but emphasises that this is simply for the benefit of the video camera and that she normally relies on “whisper light” pencil lines. In her drawing of a yellow rose she analyses and sets down its outline form and then proceeds to draw its petals from the centre outwards. A replica of this drawing, in light pencil on 140lb Bockingford paper, is then produced for painting. 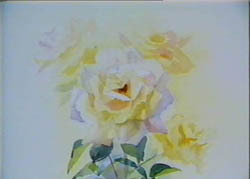 A mixture of cadmium lemon and aureolin captures the warm yellow of the rose and small areas of white paper are left to represent light catching the petals. The adjacent leaves are put in with a mixture of ultramarine, yellow ochre and cadmium yellow and the deep tone of this wash helps to emphasise the shape of the main bloom. The shine on the leaves is a wash of palest blue. There follow two exercises. The first consists of drawing a spray of wallflowers with the negative shapes being carefully observed, and this outline is subsequently filled in with a red/brown wash to produce a bold silhouette. The second is a quick impression of a white geranium head and here the artist demonstrates how the addition of pale warm and cool colours can give the subject form and shape, while keeping the detail on the lighter side to a minimum to preserve the impression of shining petals. 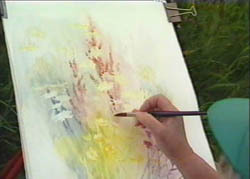 The next demonstration is of wild flowers growing in a churchyard and here she applies broad washes of yellow, pink and green on the damp paper to correspond roughly with the groups of flowers and foliage, while preserving the shapes of the marguerite heads with masking fluid. Deeper colours are dropped into this wet background to represent out-of-focus blooms which will contrast effectively with the crisper treatment of the foreground flowers. There are further demonstrations of a bluebell wood, perhaps the least successful, of indoor pot plants and of a flowerbed containing roses, delphiniums and feverfew. The last of these, painted on I40lb Arches paper, is a more elaborate painting which works well, but only a part is shown in progress. 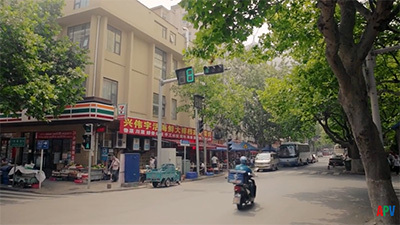 The commentary appears to be a "voice-over” and this does not have quite the interest or the impact of a running commentary, but the advice given is sound and to the point. 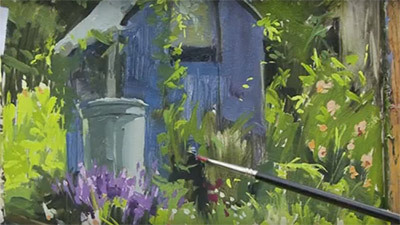 This is an interesting video "which will be of value to flower-painting watercolourists. There is, of course, a place for the formal, precisely detailed and immaculately painted flower specimens of the botanical illustrator. 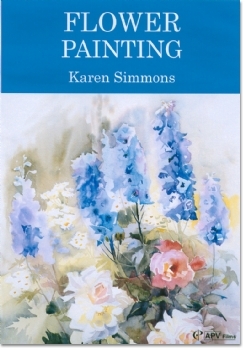 But, contrary to my expectation from reading the blurb for this video, I was pleased to discover that Karen Simmons does not practice "the exacting art of flower painting', at least not in that sense! Instead, we are taken out to capture flowers growing in their natural setting - to give them light, air, feeling and atmosphere rather than simply aiming for accurate illustration. 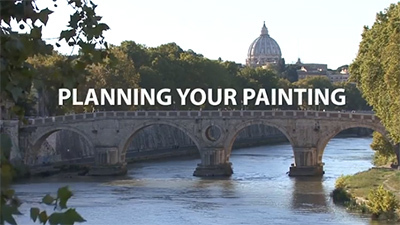 Like the best demonstration videos 'Flower Painting' combines information and expertise with some good filming and stimulating ideas. To begin with Karen Simmons gets us to look at the structure of flowers and how they grow. Before any painting there is the process of looking, understanding and drawing. Using a garden rose, she demonstrates her method of 'plotting drawing', starting with the general, overall shape into which the various petals fit and then considering the individual shapes and spaces and how these interlock to form the whole. Other useful exercises help us to appreciate silhouetted forms, make some outline drawings and analyse the more complex three-dimensional form of a flower such as a geranium which is made up of a series of florets. 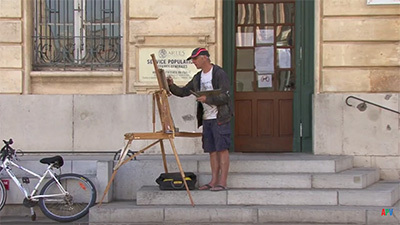 The painting demonstrations show a real feeling for the subjects, a marvellous freedom in the application of blushes of colour, some excellent wet-in-wet techniques and plenty of good advice on composition and the use of colour and colour mixing. Whether painting a group of wild flowers, a bluebell wood, part of a herbaceous border, or a collection of pot plants, the commentary is natural and entirely complementary to the manner of working which, in turn, is sensitive both to the subject and to the watercolour technique. There are some interesting ideas and techniques here, whether you are a flower painter or not. 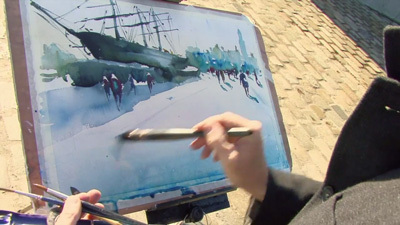 I agree that "watercolour should be witty", and much enjoyed this video - but is it really as easy as it looks! There is, of course, a place for the formal, precisely detailed and immaculately painted flower specimens of the botanical illustrator. But contrary to my expectation from reading the blurb for this video, I was pleased to discover that Karen Simmons does not practice 'the exacting art of flower painting', at least not in that sense! Instead, we are taken out to capture flowers growing in their natural setting - to give them light, air, feeling and atmosphere rather than simply aiming for accurate illustration. 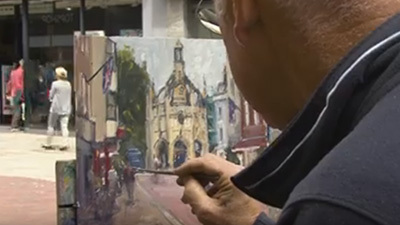 The painting demonstrations show a real feeling for the subjects, a marvellous freedom in the application of blushes of colour, some excellent wet-in-wet techniques and plenty of good advice on composition and the use of colour and colour mixing. Whether painting a group of wild flowers, a bluebell wood, part of an herbaceous border, or a collection of pot plants, the commentary is natural and entirely complementary to the manner of working which, in turn, is sensitive both to the subject and to the watercolour technique.